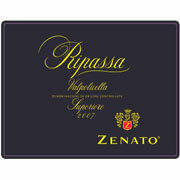 2007 Zenato Ripassa Valpolicella | Wine Splash! Deep garnet red in color with bright ruby edges. Aroma’s of dried black fruits, blackberries, dark chocolate, sandalwood, and smoke. Mouth feel is full bodied, lush, velvety, with a nice tannin structure. Flavors bursting with ripe blackberries, dried dark fruits, spices, and a hint of earthiness. Long full finish which displays some red fruits, toasty oak, & light herbal notes. Rich & balanced. Perfect pairing for a beef roast, pasta with a tomato meat sauce, and medium to strong cheeses. WineSplash Rating – 93 Points! If you have a 2007 vintage, we would drink it by 2015. WineSplashing! !